Last weekend we debated between heading to the zoo or heading to the aquarium. It ended up being a nice day out, so the zoo won out, saving the aquarium for a rainy day. The zoo again was lots of fun as we got to see monkeys fighting over food, and got to see the lesser pandas being fed. I think Liz liked the lesser pandas best again; she even got to learn a lot about them as the zoo worker that was feeding them told us all sorts of stuff. None of which I was able to understand, of course. Still, the pandas took their place in Chinese class this week. I frequently have to come up with sentences, so I used pandas twice; most recently, I asked if my classmate knows anywhere near to go see them. I only use panda because I got tired of all of my sentences being about cats, and given that I know the word for cat, it's not too much harder to get the word for panda (literally "bear cat" in Chinese). I just have to keep looking up the Chinese word for 'bear'. Christmas is coming up soon, and I'm finding that I continue to be confused. The trees are very interesting still, but I still have yet to understand why there's a plexiglass maze set up outside our office building. Even more confusing, though, is that it's never actually usable. It's always got a fence around the entrance and exit preventing anyone from using the pretty red maze, so it just sits there, every day as I pass on the way to or from work, making me wonder what's the point. We've also submitted our vacation requests for Christmas. Although we're still in Mountain View in the system, so to take the 25th off, we had to request the 27th, but work on the 27th anyway. Oh well, however it works, we don't have to come in and work on Christmas day! It's December, so it's finally time to start seeing Christmas stuff up and about (unlike the US, where the stuff starts appearing like magic sometime in mid-July these days it seems). Christmas decorations in Shanghai confuse me somewhat, though. They put up a huge 'tree' out in front of our building. It's a giant metal cone, covered in silver tinsel and purple and pink ornaments. Very tall, but not enough green. At least it's the right shape. Across the street is the green tree, but it has a mushroom top. Of the couple dozen or so trees we've seen, I've learned a new rule. If the tree is outside, you can expect that it's going to be as bizarre as possible. My personal favorite is the metal frame tree with presents hanging around inside it. Then you go and try to find Christmas decorations, since we didn't bring any with us. We managed to find a couple of Christmas ornaments on Saturday, but no good decorations at the store we'd previously seen trying to advertise them. Sunday we headed to the mall to look for some more. A six-story mall, we found one store with any sort of decorations at all. 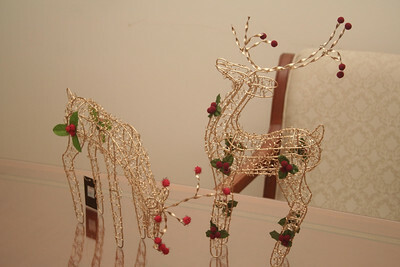 At least they weren't completely bizarre, and there are no presents hanging around inside of our new wire-frame reindeer.